Incredible. That’s the one word I’d use to describe this film if I was only given one. Incredible. From the completely fantastic CGI, to the story telling, to the way it’s all laid out and placed so delicately in front of you, it’s fantastic all around. The standard norm for telling a story isn’t present here. The usual beginning, middle and end are all here, but they’re not presented in a standard format. The timeline of the film jumps around a lot, as that’s part of the primary story. There’s a lot of repetition of days, but the way it’s done is visually appealing and doesn’t cause you – the viewer – to get lost at all. At least it didn’t for me. It’s been compared – a lot – to Groundhog Day. I think this comparison comes from people that are too unclever to appreciate this movie’s true genius. They compare it to the only other film in recent memory in which the main character (or characters) end up repeating the same day over and over again. 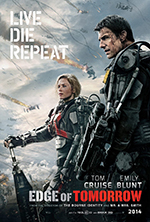 But Edge of Tomorrow is so much more than that. It’s an action movie, filled with epic battles, and character arcs, and mystery, and aliens. It’s filled with frustration of trying to understand why things are happening the way they are, and why our heroes can’t get past certain challenges. It’s a story of a journey, an often frustrating one for the characters. It’s a story of a battle for Earth, the fight to maintain the human race while a new breed of super Aliens tries to take over the planet. I was completely opposed to wanting to watch this at first. I mean, Tom Cruise, right? C’mon. When was the last good Tom Cruise movie? Interview With the Vampire? Vanilla Sky? (Ugh, according to his IMdB page, they’re filming Mission Impossible 5 right now. Ugh.) I was so uninterested in watching it, I put it off all week and finally gave in last night because there was nothing better to watch. I was completely taken by surprise at how much I enjoyed it. The special effects work, specifically the CGI is top notch. The imaginations of those creating this new – previously never before seen – alien race and the backstory that accompanied them is incredible. Imagine an octopus on steroids, but fifty times larger and that moves at speeds you’ve never seen aliens move before. It’s incredible. My only problem with the movie, as you can guess, is Tom Cruise. He could have very easily been transplanted from any of his other movie roles into this one. The acting’s the same, the dialogue is almost interchangeable, and his overall demeanor seems to never change in the characters he’s playing. I suppose one could argue that Emily Blunt’s character is also a bit washy. She starts out as this amazing badass, one that the men fear and the stories follow her around. And then, by the end of the movie, she seems to be incapable of doing anything on her own without teeny-tiny-Tom Cruise. Kind of a waste, in my opinion. That said, I really enjoyed the movie. You may not like the way the story’s told, how it jumps around and repeats itself a lot, but I thought it was quite well done. It makes me sad to say it given how much I love John Cusack. It really does. But it has to be said. 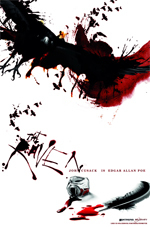 The Raven is a pile of crap. Its first problem is that it is a period piece, taking place in 1849, which is always hard to do for set designers and prop people. Very few period movies have felt natural to me. There’s always something about the way that they talk, that just doesn’t feel right. You can say right words for that period, but when you say them with inflection and tone of how we speak now, it just doesn’t feel right. The story itself is quite imaginative, but not quite enough to make me really invested in it, despite how much I love John Cusack. I really wanted to like the movie, but I didn’t find myself vested in any of what was happening. Without spoiling much of things – a mysterious person is killing people and using Poe’s poems and stories as his inspiration. So the police call Poe in to help and hand him over a gun (they were very gun happy back then, apparently.) A few short chapters later, and Poe’s fiance (Emily, played by Alice Eve) is kidnapped by said killer, who then plays a very Saw-esque game with Poe and Emily’s father (Brendan Gleeson). In the end, I’m not sure I cared about what happened. Sure, there were some cool scenes, and nice little surprise at the end. But all in all, I was almost completely indifferent as to whether or not Poe rescues Emily. It really pains me to say it, given how much I love Mr. Cusack. He just hasn’t been himself in recent years, obviously. Perhaps it’s time to get back to that sequel to Say Anything… or possibly a High Fidelity 2? To sum up: stay away from this. Unless you have a really big thing for Edgar Allen Poe, there’s really nothing great to see here. While Cusack looks the part, he doesn’t pull off being the part, unfortunately. Keep in mind that while it has some somewhat thoughtful moments, this was a comedy…Surprisingly, Farrell can pull off comedy! He should try it more often. I truly enjoyed this film, and I think you will, too! Plan a trip to see this! All right, kids! Another weekend, another Box Office run. Let’s take a look at how my predictions from last week fared, shall we? Welcome to this week’s edition of DIB?! Fool’s Gold: Matthew McConaughey and Kate Hudson made such a great romantic comedy couple, that they decided to give it another go. They may be estranged, but the lure of sunken treasure may reignite the sparks between them! Will It Bomb? I’m banking that Miley Cyrus won’t be toppled from the top spot, but this will land in the Top 5 anyway. I’m betting on the #2 slot. Did It Bomb? It looks like Miley lost her crown! It hit #1 and brought in $22 million. Nice haul! Outcome: Mezza-mezza, ½ out of 4.